Our Chili Lime flavor is a crazy good mix of smoky chipotle chilies, zingy limes, secret spices, and sea salt. This is the one flavor that is on heavy rotation on the desks around our office. 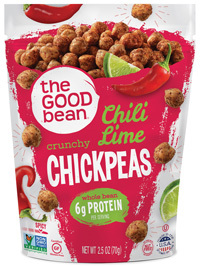 We love Chili Lime chickpeas with drinks of any kind – juices, sparkling water, or, when the time is right, a perfectly chilled beer or glass of wine.